Clear gold color. Fruity aromas of violet and lilac candies, fruit snack and spumoni, clove cigarette, and vanilla cologne with a silky, crisp, dry-yet-fruity medium body and a smooth, complex, medium-long orange flower water, sweet almond and cashew, blueberry and hibiscus and white chocolate, and honey and dried white flowers finish. A feminine and exotic spirit; a cognac-lover’s transition to whiskey. Bottom Line: A feminine and exotic spirit; a cognac-lover's transition to whiskey. 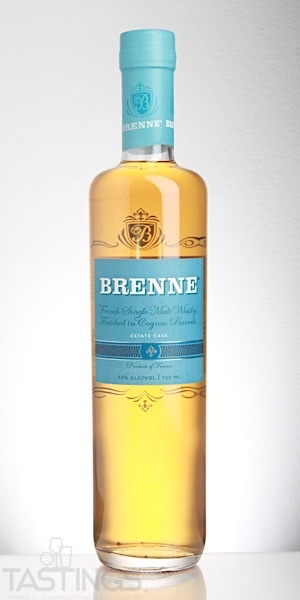 87 • Brenne Estate Cask Single Malt Whisky 40% (France) $59.99. Brenne Estate Cask Single Malt Whisky rating was calculated by tastings.com to be 87 points out of 100 on 8/16/2017. Please note that MSRP may have changed since the date of our review.